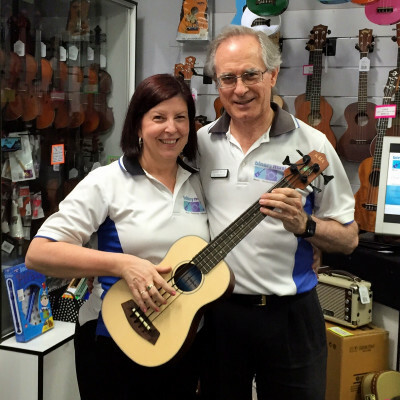 Brisbane Ukulele Musician’s Society Inc is keen to promote ukulele playing and to encourage music teachers and schools with ukulele programs. As part of the pre-festival activities for SPRUKE 2015, BUMS Inc held two music contests. 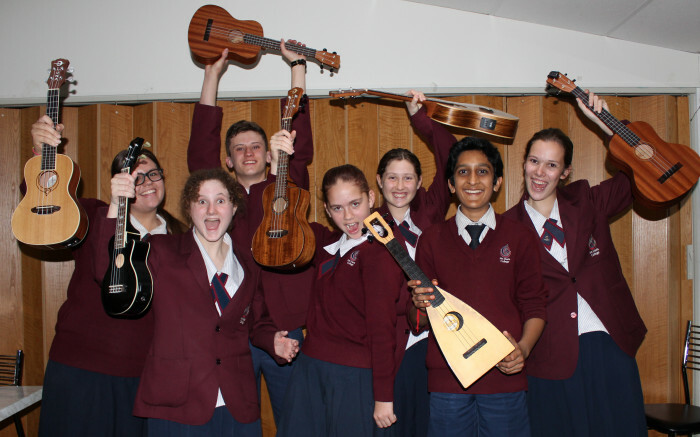 Mount Maria Secondary College, Mitchelton was the only entry for the Secondary Music Contest. Mt Maria’s performance at the Ferny Grove Jam was very popular, and they have been invited to perform on the Music Market Stage at SPRUKE on Sunday morning. Mt Maria’s music department received a $200 donation from BUMS Inc for their performance. Karen and Len Henderson of Binary Music with the first prize U-bass. Four primary schools entered the Uke’n Make Music Contest, which required the students to create a 3- or 4- part arrangement for ukulele and send in a video of their performance of the arrangement. The four schools did a remarkable job, making the judges’ decision very difficult. The Brisbane Ukulele Musicians Society Inc and Kids SPRUKE contest organisers would like to thank the teachers and schools for the enormous amount of time, effort and creativity that went into their marvellous entries, the judges for their thoughtful deliberations, and the sponsors for their generous support of the Uke’n Make Music Contest. Contest entries will be screened before the evening concerts. Prizes will be awarded at the Morris Brothers Festival Finale on Sunday 4 October 2015.